With two weeks until the election, Elk Grove voters' mailboxes are being bombarded by mailers from any number of candidates seeking office from the Elk Grove Unified School District to the Elk Grove City Council. While mailers, along with lawn signs and increasingly social media are the most typical ways candidates convey their messages, at least two local candidates are including different mediums in their campaign's arsenal not usually seen in Elk Grove elections. Those mediums are billboards and TV commercials on the local Comcast cable network. 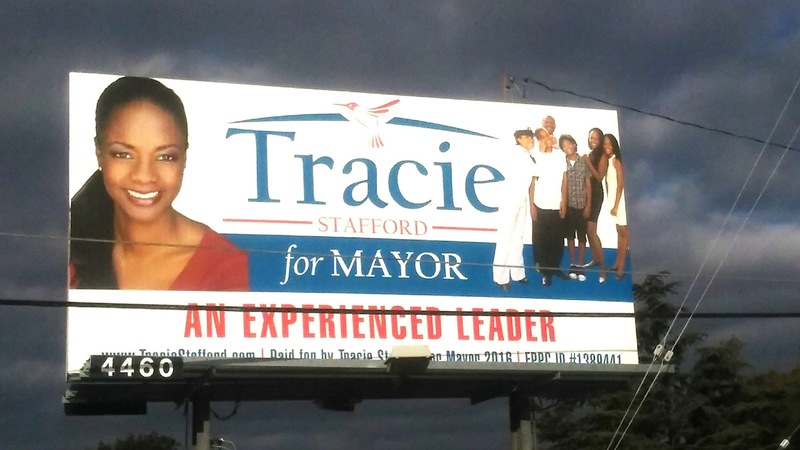 Elk Grove mayoral candidate Tracie Stafford recently purchased space on a billboard on east bound Elk Grove Boulevard between Elk Grove-Florin Road and East Stockton Boulevard. Stafford, who is a small business owner with a marketing background, said that as a non-traditional candidate, she needed to do something to grab attention. "I set out to reach the right people, at the right time with the right message," Stafford said. "What better way to reach the families of Elk Grove than with a billboard on a busy street adjacent to a middle school and high school." Stafford said the feedback she has heard from voters has been positive and it has been a cost-effective means of increasing her visibility in the seven-person field. 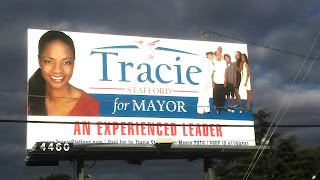 "Not only is the billboard effective in announcing my candidacy; it is also the talk of the town because, like me, it is an unexpected addition to the race," Stafford said. The other candidate seeking an Elk Grove office who is employing means other than mailers is Elk Grove Unified School District Trustee Nancy Chaires Espinoza. For her wrinkle on local campaigns, Chaires Espinoza is currently airing TV commercials on Comcast Cable in Elk Grove, Rancho Cordova, and Sacramento. The ads are geographically targeted to reach voters in the area of the school district. This morning one of her commercials was aired during CNN's 7 a.m. slot. The Chaires Espinoza campaign confirmed they purchased several spots on Comcast. Thanks to iPhone technology, the campaign also noted the production and purchase of air time are a very cost-effective means of targeting likely district voters. Chaires Espinoza, who has been on the EGUSD Board for two years, is seeking a four-year term representing the District's Area Six seat.